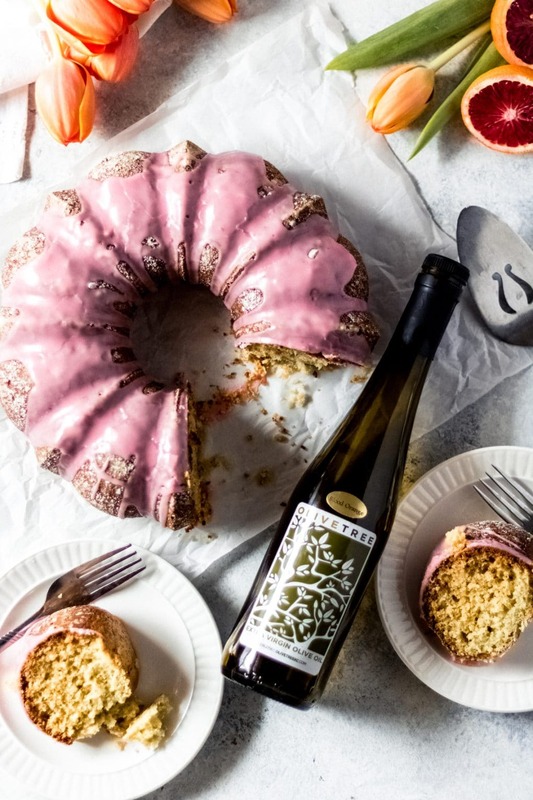 Perfect for springtime celebration, this blood orange olive oil cake is as delicious as it is gorgeous. Dense and moist like a pound cake, the ricotta cheese and olive oil make this cake unique and delicious. 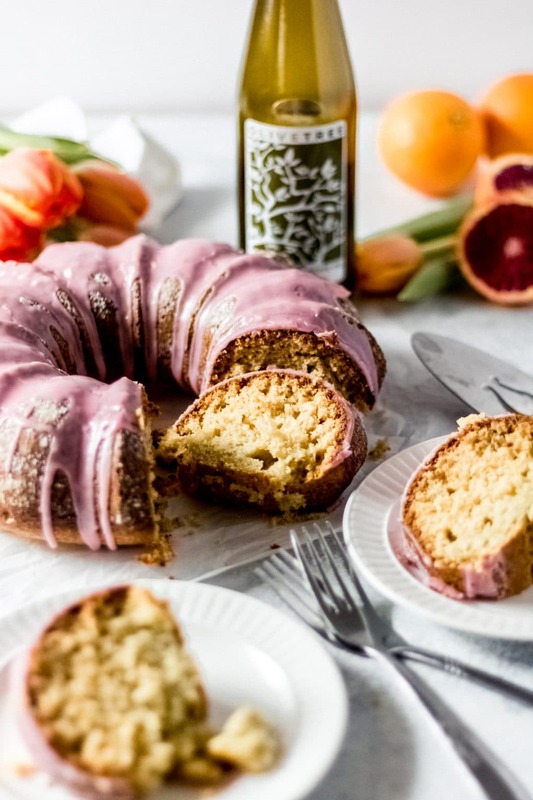 Don’t let the olive oil fool you, this blood orange olive oil cake is moist and flavorful. 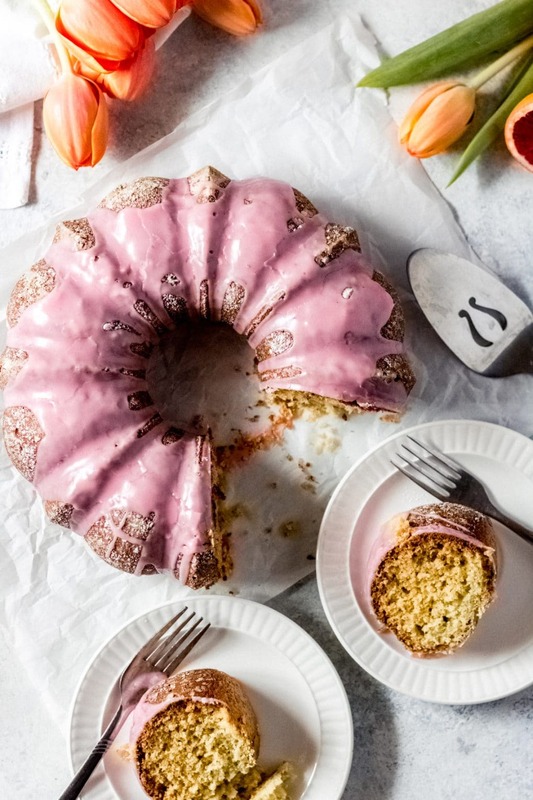 The blood orange juice creates the perfect pink colored glaze, while the blood orange olive oil and ricotta create a soft, moist cake. 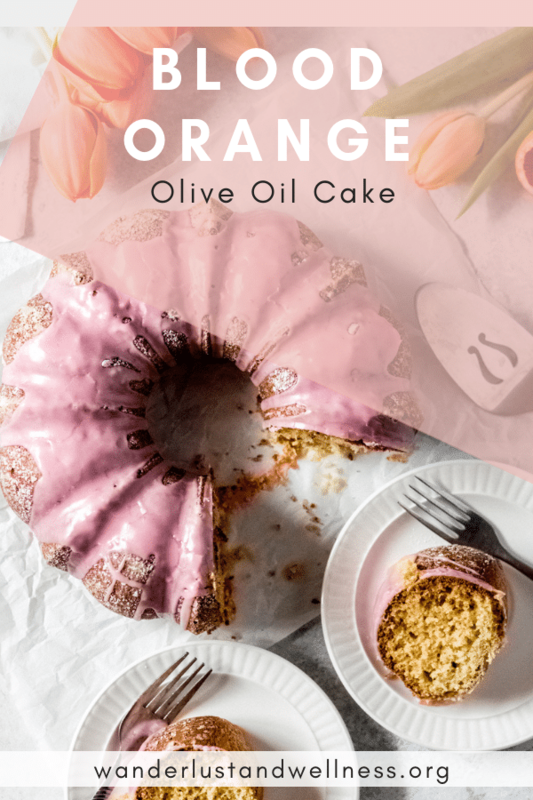 In partnership with our friends at Olive Tree in Kansas City, we’ve created this gorgeous blood orange olive oil cake using their blood orange olive oil just in time for Valentine’s Day or any upcoming springtime celebration. What is blood orange olive oil? Olive Tree in Kansas City sources only the finest extra-virgin, infused, and flavored olive oils. For this blood orange olive oil, ripened blood oranges and olives are pressed together at the mill to obtain a beautiful citrus olive oil. It’s a versatile oil with its mild flavor, making it perfect for olive cakes. You can order your own bottle of blood orange olive oil directly from their website. How do I make olive oil cake? Olive oil cakes are simply made as any other cake. You’re essentially swapping out the regular vegetable oil in a cake for olive oil. I find that olive oil also gives the cake a much richer color as well. In this cake, we’ve used both blood orange olive oil and ricotta, which results in a very moist and delicious cake. Olive oils are swapped on a 1:1 basis, so you can adjust the oil in any recipe and use olive oil instead. Olive oil cake does not taste like olives! I promise you that. 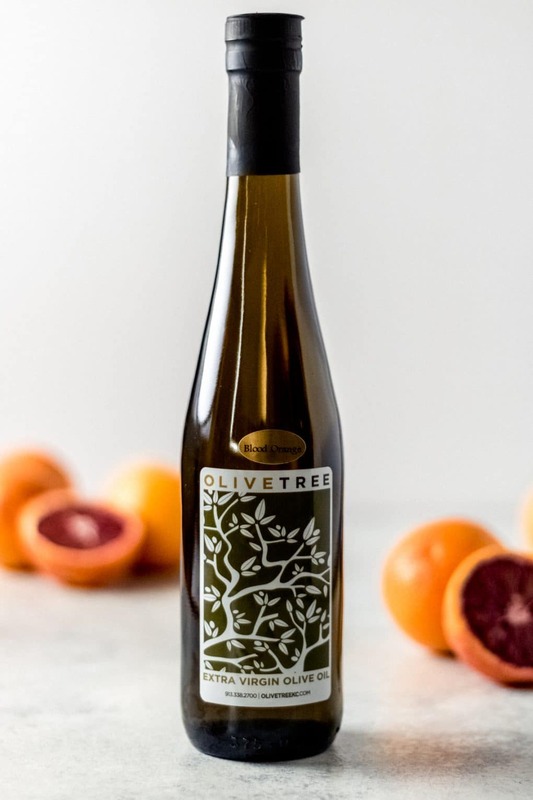 High-quality extra-virgin olive oils have a very mild flavor, and this blood orange olive has a very mild flavor while also having that infused blood orange flavor present. Olive oil cake tastes very similar to pound cake but without the dense texture. Olive oil cakes are light and fluffy. The quality of the olive oil will make or break the flavor. I recommend sticking with Olive Tree’s high quality extra virgin olive oil. This cake is dense, much like a pound cake, so it will not rise as much as a normal bundt cake. No need to be alarmed! If the glaze is too thick, add a bit of extra blood orange juice to thin it out. If the glaze is too thin, add a bit of powdered sugar to help thicken it. This simple blood orange olive oil cake is moist, flavorful, and simple to make. It’s the perfect dessert for Valentine’s Day or any springtime celebration. In a large bowl, combine the ricotta cheese, eggs, vanilla, blood orange zest, blood orange olive oil, and blood orange juice and whisk to combine. In a separate bowl, combine the flour, baking powder, baking soda, salt, and sugar. Gently toss with your hand to combine. Pour the wet ingredients into the dry ingredients and stir until completely combined. Pour the batter into the greased bundt pan and bake for 40-45 minutes or until a toothpick or knife comes out clean. Let the cake sit for about 5 minutes in the pan, then carefully invert and release from the pan onto a cooling rack. 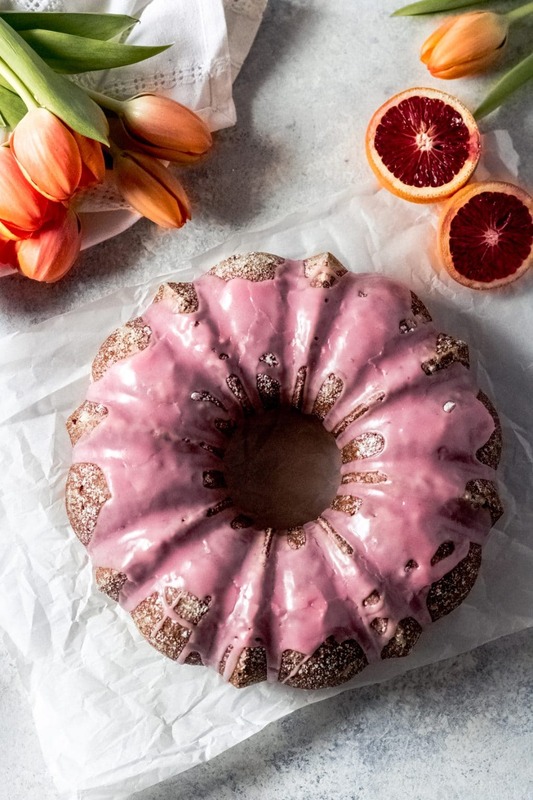 While the cake is cooling, prepare the blood orange glaze. In a small bowl, combine all ingredients and whisk to combine. You can use either a hand whisk or use a hand mixer until completely smooth. If the glaze is dry, add additional blood orange juice one teaspoon at a time. Once the cake is completely cooled, transfer to a cake stand or serving platter. Give the cake a little dusting of powdered sugar, then drizzle the glaze over the entire cake. If you like this gorgeous dessert, here’s a few more to try!